Calendar management is an essential skill for productive teams. Are your team members using their calendars effectively? Multiple calendars make it easy to overlook events and deadlines. A single access point helps you to see everything you have ahead. Seeing all of your responsibilities, events, projects, due dates, and scheduled activities in one place enables you to avoid the dangerous practice of overbooking yourself. If you have multiple calendars for family, personal life, team projects, and your work schedule, do what it takes to get them all funneled into one, single-access place so you can see the big picture. When your calendar involves multiple projects, people, and priorities, things can get fuzzy and crowded pretty quickly. Your single access point lets you see the big picture, but your coding system - whether by labels, colors, or varying access points to different calendars - will let you zoom in on the details. 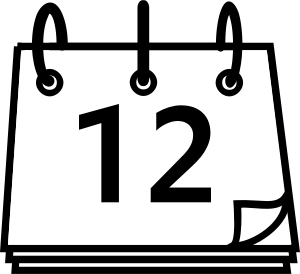 A task, or to-do item, is not a calendar event. It is not an activity tied to a specific time; it is simply something you need to do. Filling your calendar up with tasks will result in a lot of task shuffling and rearranging at the end of the day. Simplify. Instead of assigning a time/date to tasks that simply need to be done - soon - put them all in a task list. Sort your task lists by project, then block time on your calendar for the project that needs your attention. Treat that “time block” as an appointment. Find the appropriate task list, turn off the distractions, and focus on completing those tasks. When the time is up, update your task list and block additional time on your calendar as needed. No one can move timelessly from one event or task to another. Schedule in a buffer, a transition time, between appointments, events, and time blocks. This is not a luxury, but a part of reality. Transitions take time; allowing for that time makes a lot more sense than pretending it’s not there. Alternate the type of work you do in order to give yourself a mental break. Our brains function best with a variety of work. Make it a habit, as much as possible, to alternate: visual work, then text-based work, or interactive work, then solitary work. Schedule in times for physical activity, rest, and downtime. Schedule time to “be at home” with nothing on the calendar. Schedule your bedtime. Schedule your off time. Use your calendar to mark off the things you need and give them to yourself. The point of a calendar is to keep you from the mental burden and confusion of having to remember all your time-based activities. But when you don’t regularly check your calendar, it won’t help you. Your brain will be trying to remember everything. And you will be exhausted. A morning check provides an overview: what’s on the agenda for the day, what might need to change, what’s coming up in the next few days. A midday check lets you see if you are still on track: any changes in the schedule, details to add or update, reminders of near-future events or deadlines that need your attention. An evening check gives you closure and tomorrow’s starting point: tasks completed, updated notes and reminders, events that have been rearranged, and priorities for the next day. There is no point in having a calendar if you do not use it habitually and teach your brain to depend on it. Imagine how it might feel not to have constant reminders and details circling your brain. Imagine a peaceful, quiet space in your mind. That would be good, wouldn’t it? - Social HR 101: What is social intranet?